I'm Tim a Canadian who's been living in Taiwan for the last... er.. 20 years! The reason you find me posting here is that at 50 years of age I've just bought my first car ever. 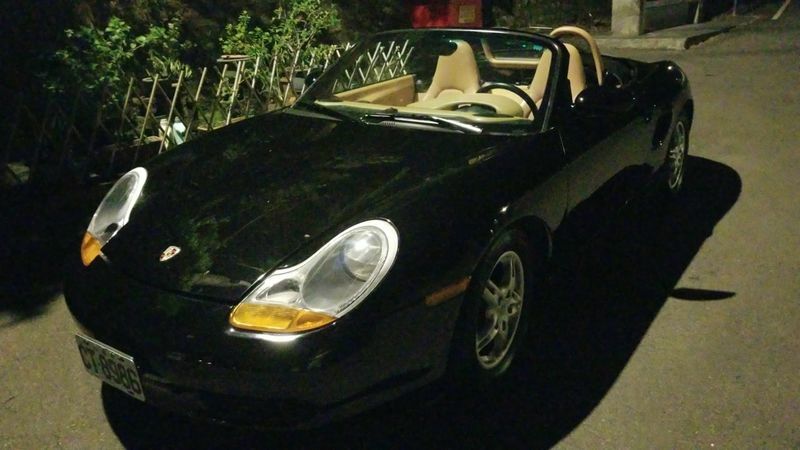 A new to me 1997 Porsche Boxster! I had the 911 poster on my wall in high school (which I thought was the most beautiful car ever) and of course was influenced by Tom Cruise in Risky Business "Porsche... there is no substitute." movie line and later when the Boxster came out I was blown away by its design. A new favourite. I'm not really a car guy but as I'm doing my best to enjoy my mid-life crisis, and as I needed a vehicle, I figured I may as well get my dream car. Now I've got a new (old!) baby that I need to figure out how to take care of... in a country where I don't speak the language (Chinese) very well. I got a 200 point inspection from some British guy here who runs a sports car shop and "knows Porsches", he had another 986 on the rack when I went to his place. He generally praised my vehicle's condition and gave me a laundry list of stuff to start replacing since there aren't any records of what the previous owner did to maintain the vehicle. Nothing exceptionally urgent or potentially catastrophic according to him. The only downside being this British guy lives a long way away from my place in the mountains... By some miracle, I managed to find a local Taiwanese guy working next to the place where I shoot pool that was a former Porsche maintenance mechanic here in Taiwan working in a Mobile 1 shop. He changed my gear-box fluid for me and now I'm researching what to change next. Very open to suggestions. Pleasure to meet all of you fellow Porsche Folks!